Today I’m going to show you how I make Korean roasted chicken, called tongdak-gui (통닭구이). Before fried chicken came to Korea in the 80s, rotisserie roasted whole chickens were very popular. No one made them at home, we went to semi-Western style restaurants called gyeong-yangsik-jip (경양식집) which also served other modern, western-influenced dishes like beef cutlet, pork cutlet, and “hamburg steaks.” These restaurants were really different than Korean restaurants at the time. They were dimly lit and kind of romantic. Going to a gyeong-yangsik restaurant was exciting and fun, and it was a good place for young people to go on dates. 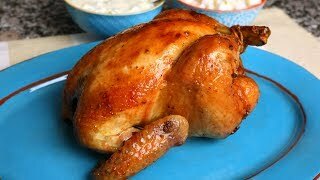 I don’t have a rotisserie at home in my house, I roast chicken in my oven, flipping it over from time to time. This way I still get the benefit of all the extra fat dripping off, leaving the chicken crispy brown on the outside and juicy on the inside. It always turns out delicious. The dipping sauce is my own invention. It’s soft, creamy, and fresh-tasting. 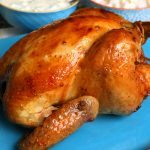 It goes perfectly with this chicken, and my whole family loves it! Also, don’t forget to make this roasted chicken with radish pickles too, which is the best way to enjoy any chicken. Rinse the chicken inside and out in cold running water. Drain. Pat dry on the cutting board. Cut off any excess fat. Combine olive oil, salt, ground black pepper, and garlic in a small bowl. Mix well and set aside. Spread the vegetable oil on the rack of a roasting pan so that the chicken won’t stick to it when roasted. My roasting pan is a 17 inch by 12 inch roaster with rack. Massage the garlic and oil mixture all over the outside and inside of the chicken. Gently pat it in. Tie the legs together with kitchen twine and place the seasoned chicken, breast side up, on the oiled rack in the roasting pan. Put it in the oven and roast for 1 hour. Remove the chicken from the oven. Brush with some of the melted butter. Use some tongs and a spatula to flip it over in the rack and brush the underside with butter, too. Take it out of the oven and brush with more butter. Flip it over and brush the underside again, too. Open the oven and brush the top of the chicken with all the leftover butter. Broil 2 to 3 minutes until the chicken is golden brown on top. Be sure to keep an eye on it so as not to burn it. Transfer the chicken to a large platter and serve right away with the cream cheese dipping sauce (the recipe below) and pickled radish. I like to cut the chicken into chunks, then diners take some with their forks (or chopsticks) and put it on their plates themselves. Add a scoop of dipping sauce to your plate, and dip and eat! Chop the cucumber and put it in a bowl. Add the salt and mix lightly. Let it sit for 5 to 10 minutes until it starts to sweat. Place the softened cream cheese, mayonnaise, and honey in another bowl. Squeeze in the juice from the lemon. Whisk together. Wrap the cucumber in folded cheesecloth a few times. Tightly squeeze out any excess water and put the cucumber into the bowl with the cream cheese mixture. Stir well and cover. Refrigerate until ready to serve with the chicken. Posted on Monday, February 12th, 2018 at 7:54 pm. Last updated on February 28, 2018. Posted November 22nd, 2018 at 8:11 pm | Log in to reply. Happy Thanksgiving from Washington State Maangchi! I was inspired by your recipe and decided to use this on my Thanksgiving turkey and it was a huge success! My whole family loved your recipe and was especially surprised by how well the sauce went with the turkey. Posted December 2nd, 2018 at 9:15 am | Log in to reply. Wow it looks wonderful! I’m so happy to hear that your family loved that sauce. This year I also made turkey! Posted May 7th, 2018 at 3:36 pm | Log in to reply. Looks so yummy,maanchi i will try as soon as i got chance to do grocery,thanks for all your recipes.i love it. Posted April 22nd, 2018 at 1:08 pm | Log in to reply. Posted April 24th, 2018 at 8:41 am | Log in to reply. Posted March 6th, 2018 at 1:37 pm | Log in to reply. Hi Maangchi, I was wondering if you could make this in Instant Pot to cut down the time. Would you recommend it? If so, what would be your approximate directions? Thank you!! Posted March 2nd, 2018 at 7:05 pm | Log in to reply. Posted February 18th, 2018 at 11:51 pm | Log in to reply. Maangchi as usual this recipe is AMAZING! I didn’t have cream cheese, so made gravy with the pan drippings instead! INSANELY GOOD!!! Thank you for sharing!!!! Posted February 24th, 2018 at 11:10 am | Log in to reply. OMG it looks great! So shiny and juicy, I can tell. It looks so delicious! Posted February 18th, 2018 at 5:02 am | Log in to reply. Amazing videos! I made this for dinner tonight and cannot believe how good the dipping sauce is! Thank you for the great work Maangchi! Posted February 24th, 2018 at 11:11 am | Log in to reply. Posted February 14th, 2018 at 5:37 am | Log in to reply. Oh my! This chicken looks soooooo good! I need to buy a big pan before I can make this…but I am already dreamy of eating this crispy roasted chicken skin! With dipping sauce and radish pickles of course. Other Korean name(s): 전기구이 통닭 (jeongi-gui tongdak) "electric-grilled whole chicken"
This recipe was originally posted on February 12, 2018 at 7:54 pm by Maangchi. It was last updated on February 28, 2018. The video was watched 1,205,594 times on YouTube & has 25,398 likes!